In what many are calling a weak class, Thursday night&apos;s NBA Draft is littered with potential flops. After 2012 was headlined by the rookie breakouts of Damian Lillard, Anthony Davis and Bradley Beal, 2013 has every indication of under-producing. This is worlds away from &apos;03. Plenty of prospects show promise. Indiana&apos;s Victor Oladipo touts impressive athleticism and defensive intensity, while Georgetown&apos;s Otto Porter has an enticing mid-range game. But many of the projected lottery picks have bust written all over them. Kansas&apos; Ben McLemore has the prototypical skill set of a shooting guard. His gaudy numbers with the Jayhawks last year and inspiring rags-to-(soon to be) riches story are reasons to like the kid. But there&apos;s definitely something missing here. McLemore vanished down the stretch in this year&apos;s NCAA Tournament, putting up 11 or fewer points in four of his last five games. And despite some lights-out shooting against Michigan in the Sweet 16, McLemore only has one year of college ball under his belt. Rumor has it, he was less than stellar in his pre-Draft workouts, and although those should be taken with a grain of salt, you have to start to wonder about his readiness for the NBA. McLemore&apos;s projected by most analysts to go second overall to the Magic, where four starters averaged over 15 a night last year. However, if he drops to the Suns, which some sources are reporting, or the Bobcats or Pelicans, he&apos;ll have no help to start his career. Being thrown into the fire on a bad team is far from auspicious. McLemore&apos;s shooting could buoy him to great heights, but that lack of experience or consistency is worrisome. Alex Len is huge. 7&apos;1" huge. Yet the dude ranked 102nd in the country in rebounding this past year, a viable cause for concern. Imagine how Len will fare against bigger, bulkier centers in the NBA. Len&apos;s steal rate was also dangerously low, seemingly trivial for big men but actually a good indication of pro potential. Patrick Ewing, David Robinson, Hakeem Olajuwon and even Shaquille O&apos;Neal hovered around two steals a game in college, while Len&apos;s .3 mark equals that of all-time bust Michael Olowokandi. Len&apos;s also had well-documented foot issues, and medical red flags certainly don&apos;t do him any good. The blocks are there, as is the post game and the court smarts. But for a player projected to go as high as first overall in a few mocks, there are an awful lot of concerns. With a myriad of questions about his ability to fit into a locker room and be a role player, the mighty fall of Shabazz Muhammad continues. Breaking into UCLA with national hype and a stellar high school resumé, Muhammad also has just one year of experience and comes with baggage. His vertical and wingspan aren&apos;t overwhelmingly impressive, and there are conflicting reports about how his pre-Draft workouts looked. Muhammad is projected by SI to go ninth to Minnesota, but how does he stay in his own niche with Ricky Rubio and Kevin Love already controlling the Wolves&apos; offense? Muhammad&apos;s critics say he&apos;s selfish and demands attention. Muhammad has plenty of things going for him, namely a scorer&apos;s instinct and moves to get to the rim. But young players with negative egos rarely turn out well. A seven-footer who&apos;s not great on the glass and can&apos;t create much offense, Withey is a safe pick toward the end of the first round but doesn&apos;t seem to have a whole lot of upside. In four years at Kansas, he never topped double-digit boards, and maxed out at 13.5 points per game his senior season. Withey&apos;s post defense is impeccably sharp, but the jury&apos;s out on whether that will translate at the pro level against more physical centers. His average frame needs work before he tips off in the NBA, and though he had a knack for stuffing shots in the Big 12, the lack of offense makes him one-dimensional. Withey&apos;s less of a bust factor because he&apos;s going to be picked later, and because teams will know exactly what they&apos;re getting with him (the Knicks have him on that SI mock, can you say Tyson Chandler II?). But if the defense isn&apos;t as good at the next level, which is quite likely, he has little value. Noel will likely be the no. 1 pick Thursday. His trajectory and numbers look an awful lot like Kentucky predecessor Anthony Davis. But how will that tenacious defense hold up amid recovery from an ACL injury, a loss of 25 pounds to an already slim frame, and less than a full season of NCAA experience? Noel has never played a game of serious significance, with the Wildcats failing to reach the tourney without him. He&apos;s too raw offensively and has yet to really prove himself. Some scouts are weary of his lack of basketball smarts, and despite being such a physical defender, does a work in progress like Noel deserve the no. 1 pick? Perhaps Noel&apos;s defense really is that good. Perhaps the dearth of talent in this Draft has Noel&apos;s status skyrocketing. 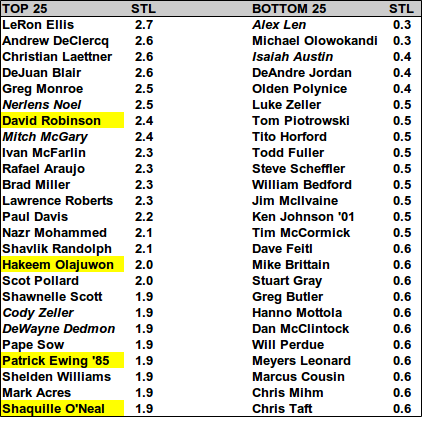 But compared to Davis and other top picks, he doesn&apos;t look all that exciting.